1. Works with all OBD-II compliant vehicles. 3. Software included for Palm, PDA, Mobile. 4. Software included for Windows PC. 5. Software included for Windows Smartphone. 2. Clear trouble codes and turn off the MIL ("Check Engine" light). 3. Display current sensor data, including: Engine RPM, Calculated Load Value, Coolant Temperature, Fuel System Status, Vehicle Speed, Short Term Fuel Trim, Long Term Fuel Trim, Intake Manifold Pressure, Timing Advance, Intake Air Temperature, Air Flow Rate, Absolute Throttle Position, Oxygen sensor voltages/associated short term fuel trims, Fuel System status, Fuel Pressure. 1. CONVENIENT & EASY TO USE: Small size, compact structure. Plug and never unplug. 2. STABLE AND WIDE APPLICATIONS: Stable wireless connection About10~20 meter for iOS and Android etc. Supports all OBDII protocols. 3. EXCELLENT QUALITY: The adapter uses the fastest and most reliable ARM chip. 4. NO BATTERIES AND AUTO SLEEP: This adapter is powered by the diagnosis size sockets and auto sleep itself after stop communication half an hour. 5. FULL MONEY BACK GUARANTEE: Get it, try it and if you don't like it, NO WORRIES, we provide a full money back guarantee! 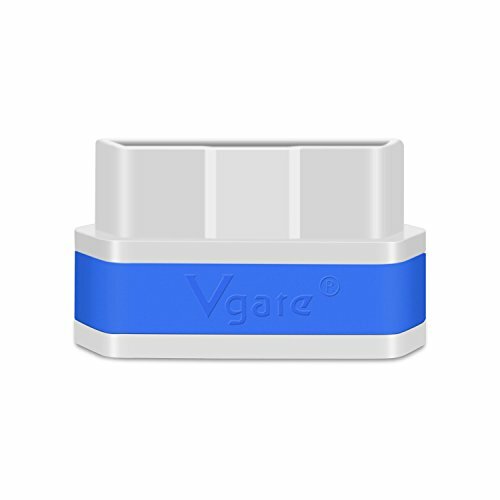 If you have any questions about this product by Vgate, contact us by completing and submitting the form below. If you are looking for a specif part number, please include it with your message.